Combine the peppercorns, vinegar and water in a small saucepan and reduce by one half. Place the egg yolks in a stainless steel bowl. Strain the vinegar and pepper reduction through a chinois, into the yolks. Place the bowl over a double boiler, whipping the mixture continuously with a wire whip. As the yolks cook, the mixture will thicken. When the mixture is thick enough to leave a trail across the surface when the whip is drawn away, remove the bowl from the double boiler. Do not overcook the egg yolks. Whip in 1 ounce (30 milliliters) lemon juice to stop the yolks from cooking. Begin to add the warm clarified butter to the egg yolk mixture a drop at a time, while constantly whipping the mixture to form an emulsion. 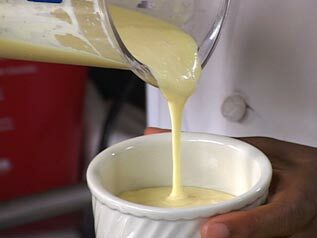 Once the emulsion is started, the butter may be added more quickly. Continue until all the butter is incorporated. Whip in the remaining lemon juice. Adjust the seasonings with salt, white pepper and cayenne pepper. Strain the sauce through cheesecloth if necessary and hold for service in a warm (not simmering) bain marie.